Cruising comes in all shapes and sizes – but the Inner Hebrides and 12-passenger Glen Etive make a combination that’s hard to beat. It was one of those priceless moments when everything comes together just as you click the shutter. Woken at 7.30am by the sound of a generator starting up, I had climbed one flight of stairs from my cabin to the dining room for breakfast. But first there was time for a quick breath of air on the open deck of Glen Etive, anchored in the middle of Loch Harport on the southwest coast of the Isle of Skye. According to our itinerary, we shouldn’t even have been there. 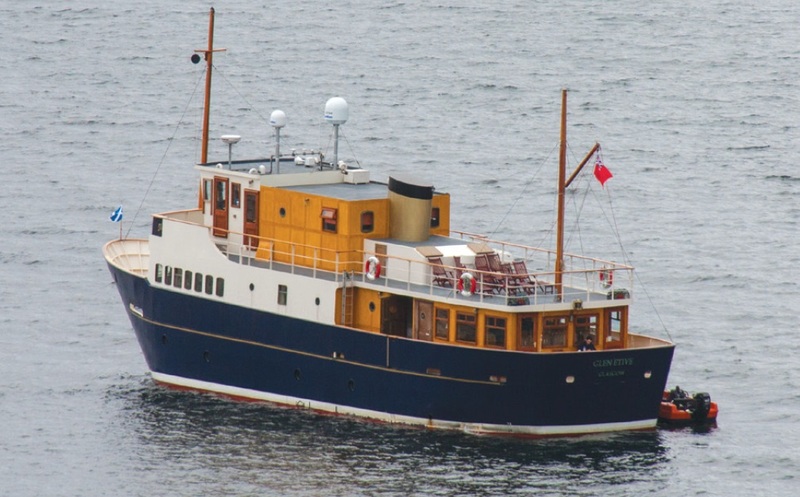 Skipper Ian Woollcott had intended to drop anchor in Loch Brittle, a few miles down the coast, but the weather forecast had changed and he had revised his plans to ensure that his 12 passengers enjoyed a peaceful night’s sleep. 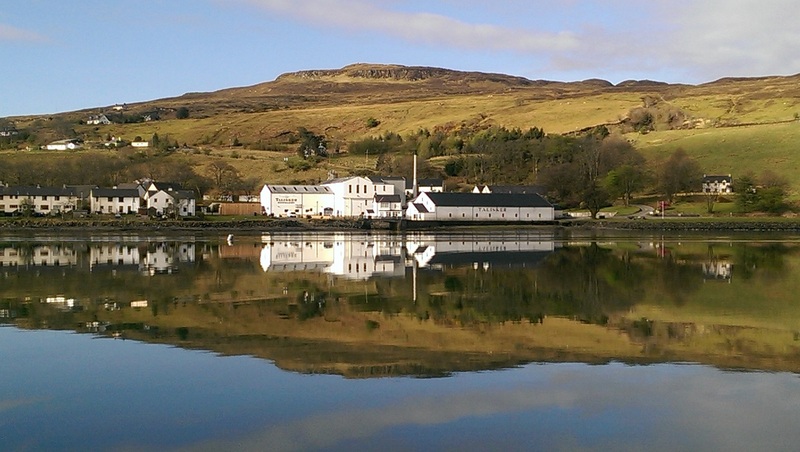 We did just that, and as I looked across to the village of Carbost, the surface of the loch was still a perfect mirror, reflecting the white walls of Skye’s only whisky distillery and the blue sky above. But it was just as well I had my camera with me, because there would be no second chance. Within a couple of minutes, the loch’s surface was corrugated by the wash from a dinghy’s outboard, and the moment had passed for ever. Timing is everything, I mused over breakfast, just as waiter Steve – who doubles as the ship’s engineer – poured a generous nip of Talisker single malt over my porridge. That is just one of many memories from my six nights in the Inner Hebrides aboard the lovely Glen Etive, latest addition to the small fleet of the Majestic Line. 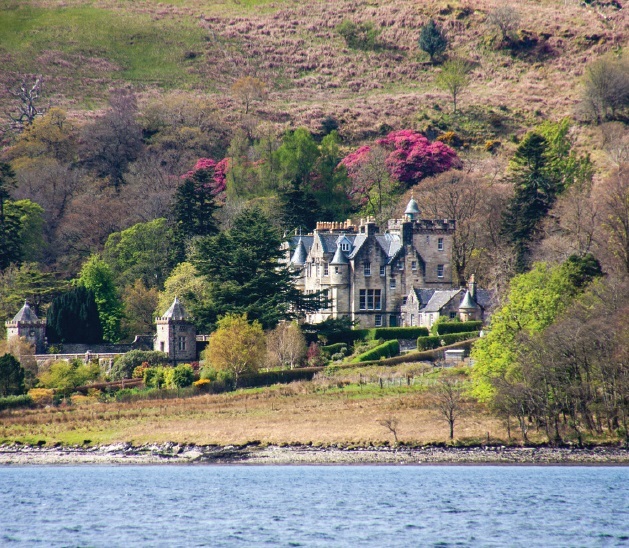 A Hebridean cruise on Majestic’s Glen Tarsan was the highlight of Jane McDonald’s all-too-brief recent TV series, and having made the same trip myself a few years ago, I could understand her enthusiasm. When Majestic invited me back, I jumped at the chance. For once, it’s acceptable to refer to Majestic’s vessels as “boats” – they carry only 11 or 12 passengers each, along with a crew of four (the company’s name, and the gold-painted funnels, were inspired by the 1990s Scottish TV series The Tales of Para Handy). 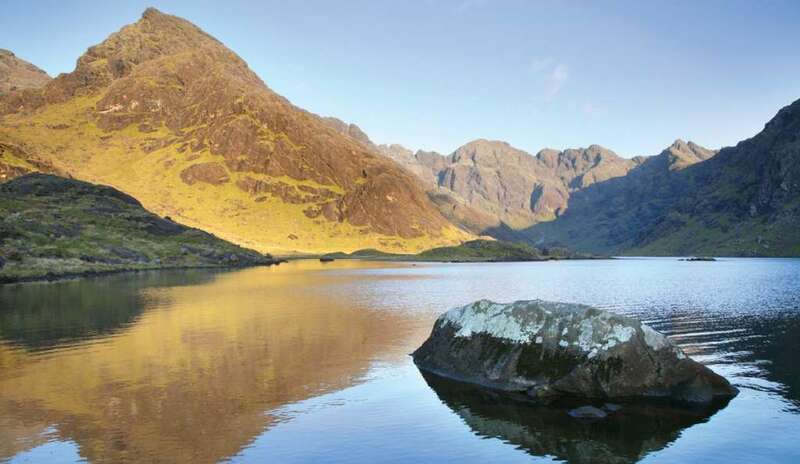 Unlike Glen Tarsan and Glen Massan, which are converted Irish trawlers, Etive is a newbuild. Fitted with stabilisers and – unexpectedly – wi-fi, she has six en-suite cabins on the lower deck and one on the main deck, which also houses the dining room and lounge/bar. And she may be small but she proved the perfect platform from which to explore these beautiful but sparsely populated islands. The day before my photo-opportunity, we had been ferried ashore at Loch Skavaig, watched by dozens of seals – most of which appeared completely indifferent as we motored slowly past. A couple of young ones dived into the water but their elders remained unperturbed on the rocks, basking in the early afternoon sunshine. The aim of our trip to this remote spot, where the only signs of human activity were a white-painted bothy and a rusting jetty, was to hike round the freshwater Loch Coruisk, encircled by hills and offering spectacular views of the rugged Cuillin range in the background. Short of a strenuous hike from the other side of the island, or a treacherous cliff-path traversing a hazard known as the “Bad Step”, the loch is accessible only by boat. Artist JMW Turner was commissioned by Scott to paint the loch but almost fell to his death in the process, writing that “but for one or two tufts of grass” he would have broken his neck “having slipped while trying to attain the best position for taking the view”. After I had climbed past the waterfall that drains the loch into the sea, to reach the giant slabs of granite thrusting through the boggy ground of the foothills, it was easy to understand the feelings of those earlier visitors. It was soon apparent that a hike around the four-and-a-half-mile perimeter of the loch was not going to happen, and I settled instead for a few pictures before returning to watch the seals. 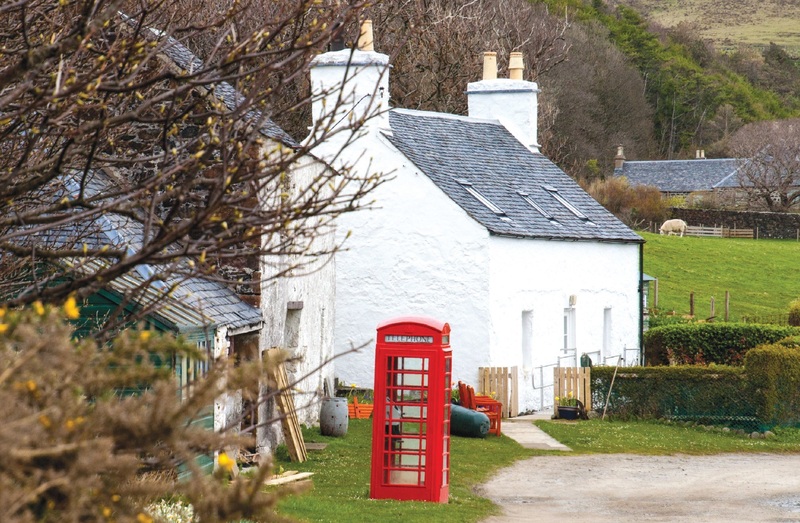 The small island of Canna provided a much gentler walk later in the cruise, taking in two churches serving a population of just 12, its Post Office (in a green garden shed) and its surviving red telephone box. Outcrops of basalt pillars above an old Celtic cross show the island’s geological connection to Staffa, a few miles away, and the 21st century has brought a coffee shop. This closes on Tuesdays – the day we visited – but that was no hardship because we were being so well fed and watered on board Glen Etive. Using mostly local produce, chef Mike Weir managed to conjure up three feasts a day from his surprisingly spacious kitchen. The mussels on our last night aboard could not have been fresher – harvested from the farm in Mull’s Loch Spelve that supplies most UK supermarkets. We also enjoyed beef and venison from local farmers; fresh-caught cod and haddock, served with delicate sauces that would have the Masterchef judges licking their lips, and a truly splendid cheese board, with different varieties each evening. Between meals – taken with all 12 passengers sitting around one table – and our walks ashore, there was time to appreciate the magnificent scenery of Scotland’s west coast and the Inner Hebrides. Braving a chill breeze, some passengers spent hours out on the top deck, scanning the sea for whales and dolphins, the skies for eagles, and the clifftops for deer and goats. Others relaxed in comfortable armchairs in the warmth of the small library, where attentive bosun Darin would be ready with a pot of tea or a glass of something stronger as they read guidebooks ancient and modern in preparation for the next adventure. Guests are also welcome to join the skipper on the bridge – a place where old technology meets new. A traditional ship’s wheel and a shiny brass compass, made in 1942 and salvaged by Majestic’s co-owner Andy Thoms, dominate the wheelhouse but Captain Ian does all his navigation with the aid of GPS, computer screens and a mouse. That’s Majestic Line summed up in a sentence – the finest of today and yesteryear combined, providing the most memorable of experiences at sea.